With modern technologies taking over many aspects of our lives, it has become increasingly difficult to let go of traditional devices. Electronic books (eBooks) and online reading have become increasingly popular among the world of literature. Despite the benefits to both choices, for many, using eBooks is a more convenient and affordable decision than using paper books. With eBooks simply requiring a device to use, they are much more convenient to use than the standard paperback books. Instead of carrying around a book on a regular basis, individuals would only need to download the book on their devices, which is especially beneficial for students as it lightens their heavy load. Through the use of eBooks, users would have easy access to any book at any time rather than just one or two, given that the books are downloaded beforehand. In addition to the ease of carrying them, eBooks allow for stronger readability over standard books. With eBooks, you can adjust the font size and brightness for a more comfortable read, even allowing for late-night reading sessions without having to turn on any lights. Beneficial to all ages alike and in different situations, ebooks’ adjustability makes them much more practical in a day-to-day setting. Besides the convenience that eBooks provide, they also enable texts to be preserved for a much greater time period rather than standard paperback books as you can download and upload them online for future reference. “If I were to read a book this year that I really enjoyed and downloaded it onto my phone, it would be much easier for me to read ten years from now rather than keeping the actual book,” junior Kameran Mody said. In one study in favor of paperback books by Naomi Baron, students argue that reading on print is easier on the eyes and more enjoyable. She goes on to explain how paperback books offer more retention rather than online reading. While this is true, if the reader is reading online, there is an ease to clarify those confusions by finding further material. While traditional paperback books do offer benefits including a more tactile and traditional feel, eBooks provide a more convenient experience. With the ability to read hundreds of different books at a time and ease of finding information, eBooks offer many benefits that tradition books can not offer. With the advent of eBooks and other digital reading devices, technology users have access to a plethora of traditionally paperback works. Despite this new avenue for accessing works of literature, physical paper books will always hold more value than eBooks, as they provide a more engaging experience for their readers. Paperback books give readers a physical connection to the story they are reading, and each flip of a page adds to the experience of progressing through the book. “You have the tactile sense of progress … Perhaps this somehow aids the reader, providing more fixity and solidity to the reader’s sense of unfolding and progress of the text, and hence the story,” researcher Anne Mangen from Stavanger University told The Guardian. Additionally, paperback books allow us to stay focused and engaged in the plot of a story or premise of an argument. When reading a book, you can easily fall into a “reading groove,” which thus provides an immersive experience where every simile and metaphor speaks volumes. “In this study, we found that paper readers did report higher on measures having to do with empathy and transportation and immersion, and narrative coherence, than iPad readers,” Mangen also reported to the Guardian. 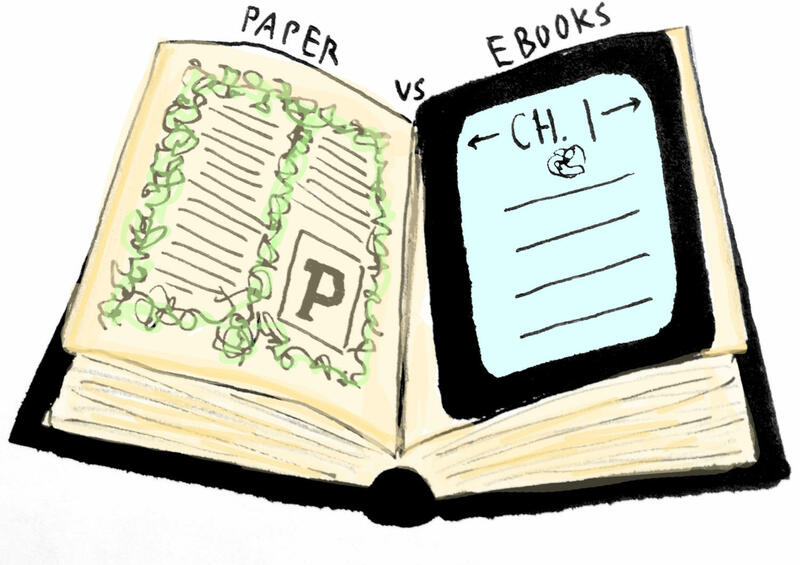 Unlike traditional paper books, eBooks can easily become a distraction for readers, as the devices one reads on has other purposes, including online communication, games, etc. Due to the multitude of uses for online devices, readers are not directly engaged with the books they are reading and are not able to deeply appreciate the beauty of a novel. Though eBooks’ ease of access is seen as an advantage of real books, it actually further lowers a book’s sentimental and physical value. Since eBooks can be easily downloaded, previewed and summarized online, many readers do not spend time thoroughly enjoying and understanding a novel front to back. Instead, they skim through pages on a screen and impatiently jump to the next book on the list. There is no doubt that paperback books provide a far more superior reading experience, as their physical substance outweighs the empty words of an electronic screen.